It's always interesting to see another country's take on American culture. Sometimes they gate it right. Sometimes they get it wrong. Other times, it just causes one to scratch one's head in bewilderment. The latter reaction is what we experienced upon viewing this ACW Grey Israel-created ad for VW. 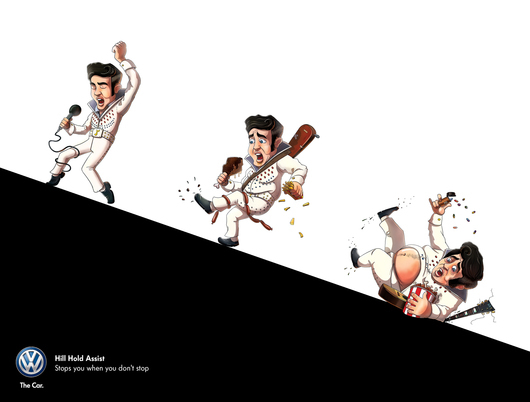 Using Elvis -- from his skinny days to his fat days -- the agency is promoting the brand's Hill Hold Assist feature. Except, it isn't doing much for Elvis who is far from holding his ground on the incline. And the tagline makes no sense either. Yes, we get that it's an analogy for helping Elvis cease his increasing girth but if Hill Hold Assist really works, why is fat Elvis falling down the incline? Does this mean VW's Hill Hold Assist only assists non-fat people? If so, that would just be prejudiced, right?